These are just some of the children in one of the community care centers. Robert giving us a tour of one facility they use to care for the children. After visiting the care centers and seeing first-hand the amazing work that is taking place, we knew we had to return to help Anugrah because we were really impressed by the project. We asked them how we could help and conducted a needs assessment. Two acute needs were discovered: funding and staff upskilling. Anugrah has been losing funders and their staff needs more help in order to address the needs of the kids and families. So, we are returning in February 2018 to help with strategy for the project and with training for the community-based staff and workers. Our strategy and sustainability team will immerse themselves in the operations and challenges of caring for those with disabilities and collaborate with doctors, community volunteers, and stakeholders to develop a strategic plan to ensure the sustainability of the program. 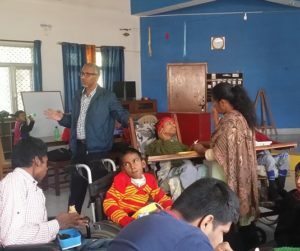 For our training and support team, we are looking for people in the medical field who have worked with people with disabilities to equip, train, and support the local workers. 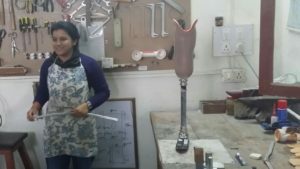 We also need someone with carpentry skills to help their staff continue to make their own prosthetic limbs and wheelchairs. The center makes prosthetic limbs with nice designs on them for the children who need them. I had long thought about ways to give back to the broader community when I stumbled across Venture 2 Impact for the first time. In all my attempts to try and find a way to give back I was struggling with finding something where I felt I could really contribute uniquely with my specific skill set in a way that seemed sustainable to the community I was trying to help. Stay updated with our latest news online.